Akshaye Khanna is gearing up for the release of his upcoming, The Accidental Prime Minister. Unfortunately, the film has been involved in a controversy about the time of its release but Akshay sees no problem in that. The actor talked about the film and the hullaballoo it has generated in a recent interview with the daily. 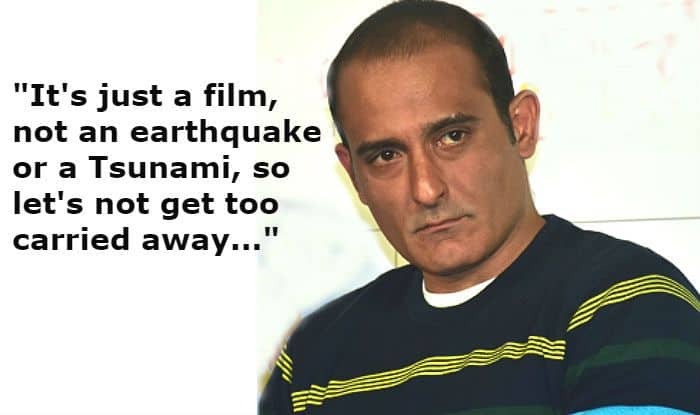 Akshaye said that India is a politically conscious country and therefore, people are expected to criticise or praise a film made on political content. He told Mumbai Mirror in a detailed interview, “If you make an authentic political film, which talks of real people and real events, in a politically conscious country like India, it is but natural that people will react to it in different ways and there will be a collage of opinions. That’s to be expected and if it didn’t happen, I would have been disappointed. But at the end of the day, it’s just a film, not an earthquake or a Tsunami, so let us not get too carried away”. Akshaye, who plays the character of writer Sanjaya Baru in the film, is also of the opinion that The Accidental Prime Minister presents something in front of the audience that they haven’t seen before. He said there have been films on Buckingham Palace, the White House, and the 10, Downing Street but there’s no film made on the office of the Indian Prime Minister. He added, “I was convinced that people would be interested in an inside peek into this world and given that we are the largest democracy in the world, the time had come to open a door that had many, many locks on it. I was impressed that a producer had the vision, confidence, integrity, and guts to spend money on a film like this one”. Earlier, Anupam Kher commented on the controversy and said that any kind of conversation about the film will help promote it better and therefore, he is fine with it. The Accidental Prime Minister is slated for release on January 11.